In brief, here is why we have been feeding and promoting raw food for several decades and why some vets want your pets to be getting dry food. 1. Dogs forced to eat dry food, which is full of carbohydrates because they're cheap fillers, MUST have their teeth cleaned once or twice a year, because dogs don't produce the enzyme needed to break down sugars in their mouths-expensive. If your dog has bad breath, he has gum disease, which wreaks havoc on the organs, usually starting with the kidneys (it's one of the biggest silent killers caused by the pet-food industry). Kidney failure costs many thousands of dollars to combat and control but is not reversible. 2. Excessive carbohydrates in dogs is like giving too much sugar to children, and what ensues are behavioural problems linked to excess energy: anxiety, grumpiness, and aggression. 3. Processing in dry food removes or makes more unavailable the nutrition that the dog needs. For example, in raw chicken, the bioavailability of protein is about 95 percent; in dry food, it's between 18 and 42 percent. It's the poor quality and availability of protein in dry food that causes slow growth, bone problems, skin and ear infections, epilepsy, cancer, all of which mean lots of expensive trips to the vet. Protein deficiency is also linked to timidity and aggression. 4. According to ongoing studies in Europe, dogs fed fresh food live between 3 to 6 years longer and are 90 percent less likely to die from cancer. 5. Dry food is almost void of enzymes that are absolutely essential for health. Apart from general poor health and shorter lifespan, a lack of enzymes puts the pancreas under immense stress to compensate, leading to pancreatitis, a painful, sometimes fatal condition that can be expensive to treat. 6. Dry food is the leading cause of obesity in pets, due to both the extremely high concentration of calories as well as the rancid fat that the essential fatty acids within dry food turn to once the bag is opened. Obesity causes diabetes, vomiting, chronic diarrhea, high blood pressure, skin and coat problems, liver failure, pancreatitis, arthritis, heart disease, asthma, allergic skin disease, inflammatory bowel disease, bladder disease, and kidney disease. A fat dog is an expensive dog when it comes to vet bills. And skinnier dogs live longer. 7. Dry food causes dehydration by pulling water from the body, leading to some life-threatening and costly conditions, such as urinary crystals, bladder stones, bladder infections, FLUTD, constipation, and kidney disease. 8. Dogs and cats used to raw food NEVER refuse a meal like they do when faced with a bowl of pellets. When our dogs say no to fresh food, it's a life-saving early warning that something is wrong and we immediately take them to the vet. Early treatment is more effective and much cheaper than finding out too late that your dog or cat was sick and not just refusing her unappealing kibble again. Cats who don't eat every day are in particular danger of developing a life-threatening liver disease that is very expensive to try and control. 9. Because of the harmful effect that processing has on proteins, animals who are forced to eat dry pellets are more likely to suffer from allergies and food intolerances. 10. 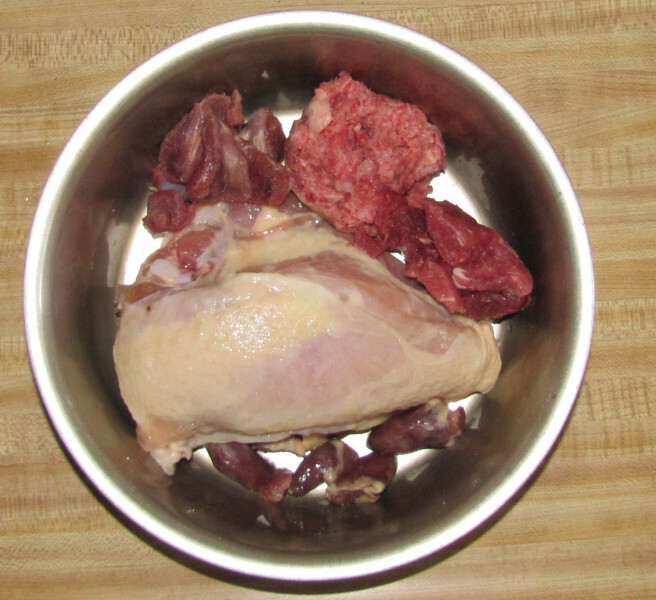 Dogs and cats LOVE raw food, and you get to control exactly what they eat. Make sure they get enough variety, meat, bone, and organ meat, and offer a few health-boosting supplements and essentials such as fish oil, seaweed powder, eggs, vinegar, and garlic, and you will have not just a healthy dog but also a very happy and fulfilled one (cats need fewer supplements). Most vets do not study nutrition other than what they are told by the pellet manufacturers' salespeople. If you want to know what food will help your pet have fewer costly and painful vet visits and live a longer, happier life, consult a qualified animal nutritionist—one not linked to the multi-billion-dollar dry-pellet industry. SAVE MONEY AND YOUR PET’S LIFE—FEED RAW!